While you are on vacation in a national park, you want everything to go smoothly. You don’t want crowded hiking trails, full parking lots, zero wildlife in sight, or to waste any time driving around trying to figure out what to do. You also don’t want to miss anything, right? 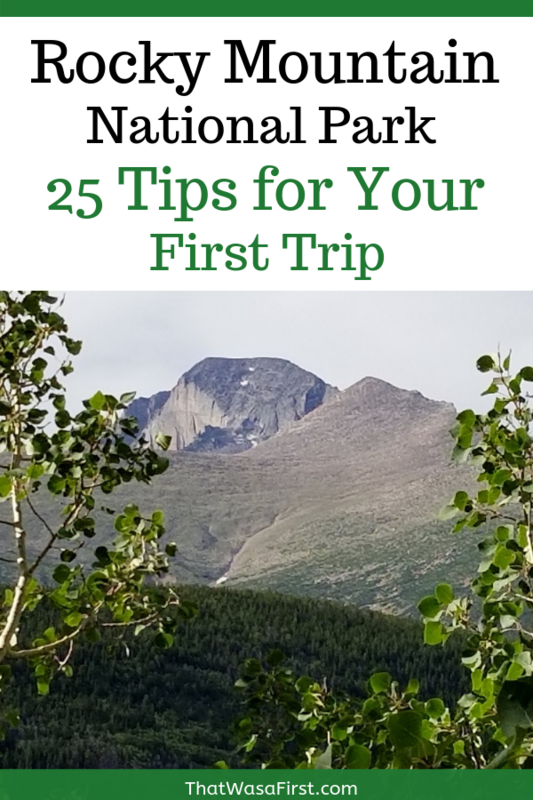 As a regular visitor to Rocky Mountain National Park, I’m going to share my family’s top 25 travel tips to get the most out of your first visit. 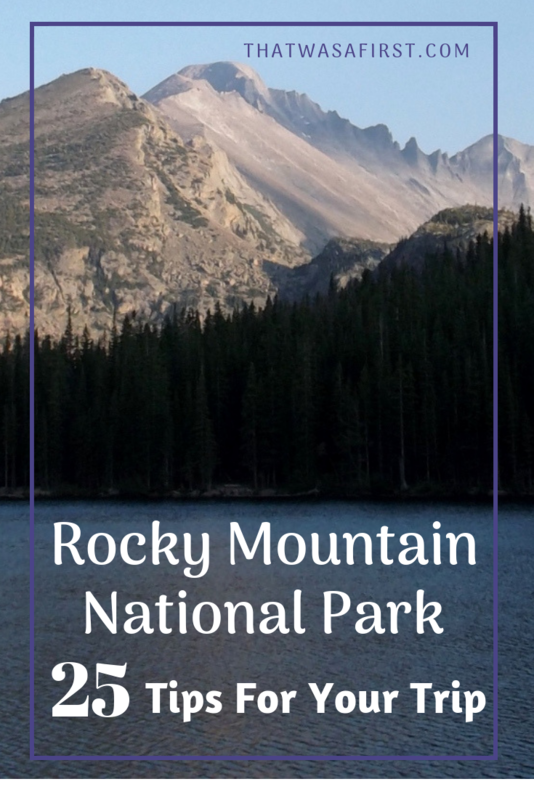 The week that we spend in Rocky Mountain National Park (RMNP) each year, is always our favorite! We stay in Estes Park, and spend our days hiking, shopping, and eating. It’s perfect! How can I say it’s perfect? Well for one, the scenery is amazing, the weather is warm, the shopping is good, we always see elk, the food is tasty and I could go on! How’s that for one reason? 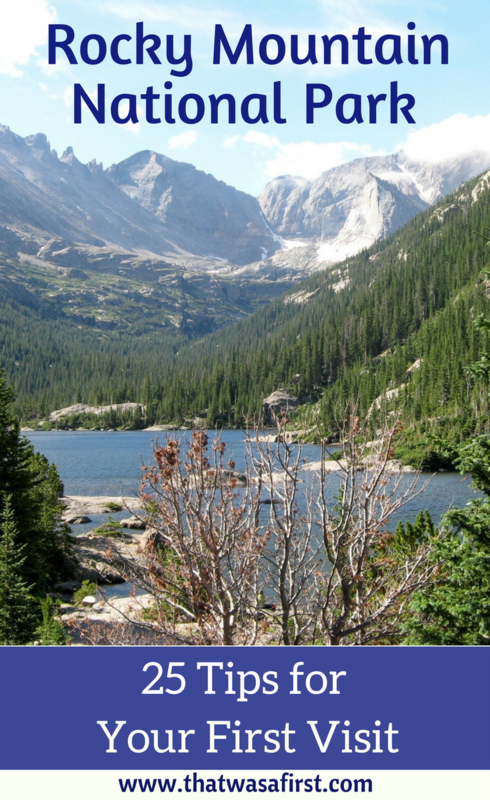 We also know a little bit about RMNP and how to help make your visit there enjoyable and relaxing. Go early in the day! This is my most important tip, especially if you are hiking. You will have a completely different experience if you are in the park before the crowds, the higher temperatures, and the likely afternoon rain shower. The animals are out in the morning, and you really feel like you have the whole park to yourself. I realize this isn’t practical for everyone, but I encourage you to try to arrive early at the park at least one morning of your trip. How early? We usually go in between 6:30 and 7:00, but even if you get there by 8:00 you will be ahead of a lot of people. Does your family want to save some money on your park entrance fee? Well, if you have a fourth grader, you are in luck! There is a fantastic program called Every Kid in a Park, that is providing a free pass to every fourth grader across the country to enter the National Parks, public lands, and public waters! What a great way to get families into the parks and it’s educational too. Find out more about it here. We used this pass two years ago when we had a fourth grader, and the whole family was able to enter RMNP for no charge. One more year, and we’ll get the pass again! If you are age 62 or older, and plan to visit more than a few national parks during your lifetime, buy a lifetime pass. This one time purchase will get you into the national parks for the rest of your life! This is an excellent deal at the price of $10. But, since all good things must come to an end, the price of the pass increased to $80 on August 28, 2017. If you really don’t want to drive in the park, you can take a shuttle bus. The shuttle bus is also an option if parking lots are full or if the park is extremely busy. The shuttle bus leaves from the Estes Park and the RMNP visitor centers. RMNP has seven visitor centers throughout the park. The larger centers are Beaver Meadows, Fall River, and Alpine. The hours vary and so do the exhibits and programs. I recommend stopping at all three of the larger centers for information, education, souvenirs, and programs. Talk to the park rangers. There are rangers at the visitor centers, major trail heads and stations throughout the park. Ask questions, they are happy to help! When you enter the park, you will be given a park newspaper. One page of the paper will tell you the schedule of the ranger programs. During the summer, RMNP offers ranger led programs about various topics. 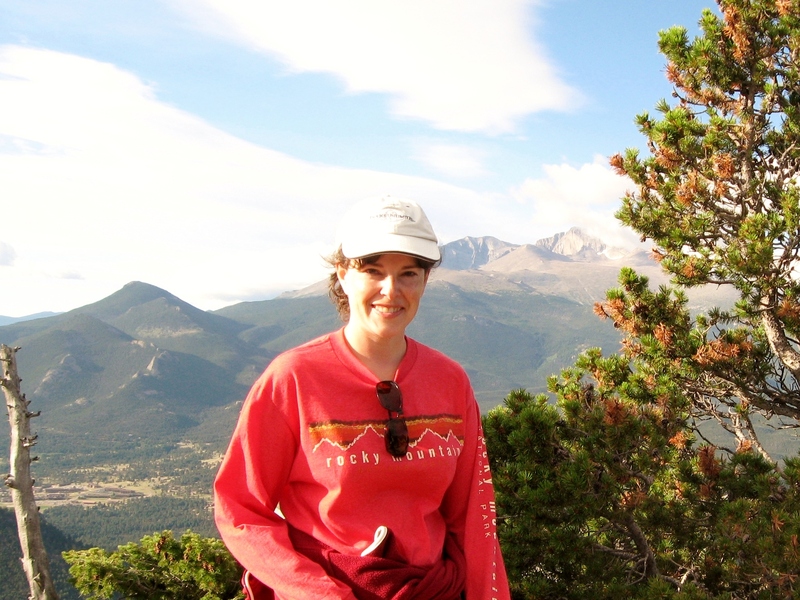 We’ve been to programs about Longs Peak, photography, wildlife, and trees. If your kiddos are taking part in the junior ranger program, a lesson from a ranger is one of the requirements to graduate. Enter your kids into the junior ranger program. There are activity booklets for various age groups, and you can pick up the books at the visitor centers. Once they complete the booklet, they take an oath to become an official junior ranger. This is a very fun way for them to learn about RMNP and the great outdoors. If your kids are too old for the junior ranger program, there is another fun activity to do in the park. Geocaching! There is no better way to get out into the park than to be hunting for a cache. I didn’t know this was available until recently, and we will be checking out the fun. 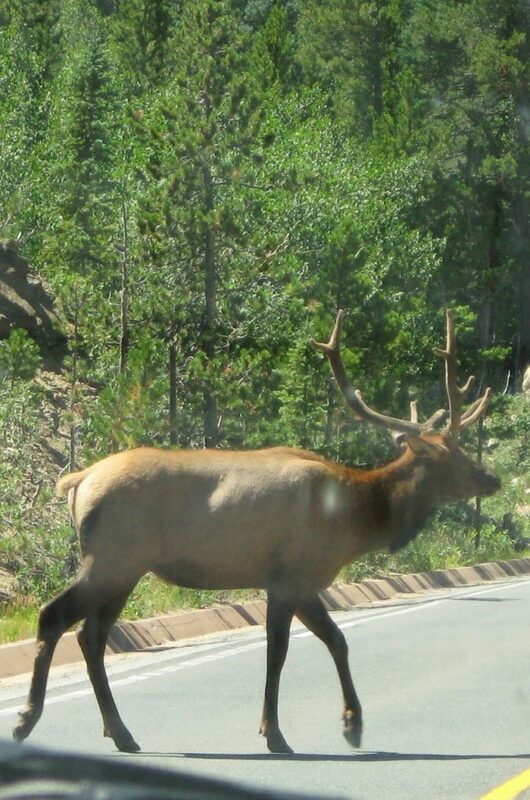 Some people visit RMNP for the hiking, fishing, or just the scenery, but everyone wants to see some wildlife. The best times to see the elk, deer, moose, and more are in the early morning or evening. After dinner, we always cruise into the park hoping to spot some elk. A popular place to see the elk is in Morraine Park. We also have luck seeing some elk in the Sprague Lake area and on Trail Ridge road. Last year, we saw more elk than ever during our visit to RMNP. You will see elk, but only if you know when and where to look! Bring binoculars (here’s a great pair for under $10). You will use them for spotting wildlife and rock climbers. If you hike within sight of Hallet Peak, look for rock climbers. We see them more often than not. If you spot wildlife close by, do not get out of your car. You can get that awesome picture from the comfort and safety of your seat. At some point during your trip, you will probably see a tourist walking toward an animal trying to get that close up shot. The animals are wild and run much faster than you think. Research your hikes. You need to know distance, altitude, elevation gain, trail conditions, and the day’s weather forecast. You don’t want to get your family into any bad situations. Talk to rangers, read the numerous hiking books available, and research online. Also do the lower elevation hikes earlier in your trip as your body adjusts to the altitude. Some hikes are better for families than others. Don’t drag your kids on a hike that is above their ability. No one will be happy! If you are hiking, carry water with you. And snacks, a camera/phone, bandages, and more water. There has been more than one hike that we’ve given someone else a bottle of water. It’s tough to hike at the higher elevation. The best thing to do is carry a small backpack with you for all of your gear. If you are hiking in June, there may be snow on the ground. We’ve even seen it snow in August. The weather can be crazy in the mountains! Don’t pick the wildflowers or other plant life. Leave. No. Trace. If you are doing the popular hike to Mills Lake, try to park in the Glacier Gorge parking lot. If you have to park in the Bear Lake lot, you will be adding another 1 1/2 miles onto your hike. That last 7/10’s of a mile from the Glacier Gorge parking to Bear Lake is all up hill. You can pick up a shuttle bus at the Glacier Gorge parking lot and ride it to Bear Lake, you may just have to wait a short while. 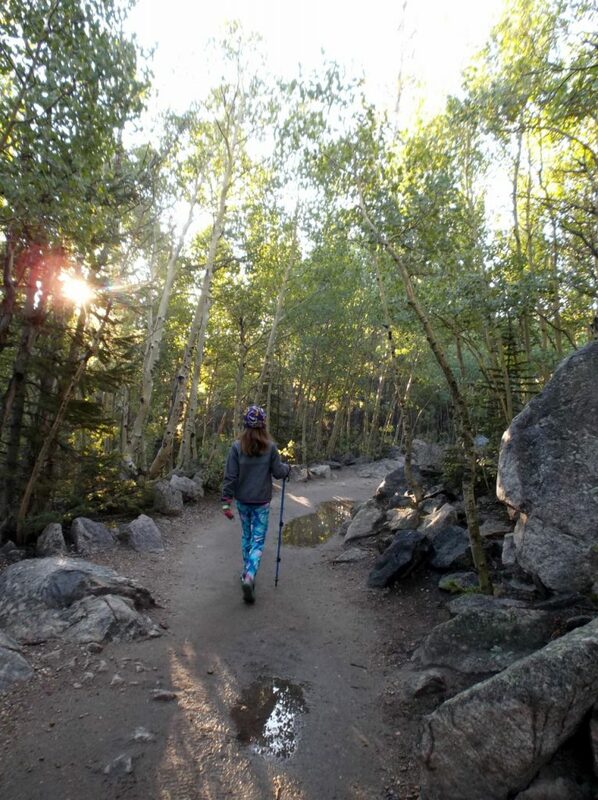 Start your hikes as early in the day as possible. The popular hikes get very busy. The best part of my morning is when I’m cruising back down the hiking trail, and passing by all those hikers making their way up the trail. My “good morning” is always more cheerful than theirs. Another benefit of hiking early, is that you avoid those rain showers that seem to pop up every afternoon. The mornings can be cold though, so dress in layers. If you want to do some fishing in the park, you can get your license, bait, and insider info at the various fly/fishing shops in Estes Park. Each lake has it’s own rules, so be informed. Your family may want to picnic in the park, because there’s nothing better than a meal with a view. There are some pretty nice picnic spots in the park, and our favorites are Hollowell Park, Hidden Valley (there’s no ranch), and Sprague Lake. Again, leave no trace. A great way for families to get out into the park during the less crowded times of the day, is to take a walk around a lake in the evening. Our family always takes an evening walk around Sprague and Bear Lakes. It’s quiet and a perfect way to end the day. One thing that you have to do on your visit to RMNP is drive Trail Ridge Road. The views are amazing. The road has a number of scenic overlooks and you want to take advantage of them. Take your time and take a lot of pictures. The drive up and down Trail Ridge Road takes a while, depending on your stops and traffic. Plan for your trip to take at least a half day. You will want to spend some time looking around at the Alpine Visitor Center too. There is food and beverages available at the Alpine Visitor Center. Old Fall River Road. You either want to drive it or not. This is a one-way road that ends up at the Alpine Visitor Center. It’s a gravel road, full of switchbacks, steep drop offs, and has a 15 mph speed limit. It’s very scenic, I’ll give it that. We’ve driven it once, and I was pretty nervous the whole time. It didn’t help that we could see one of those afternoon storms coming toward us. That afternoon storm even dropped some sleet and snow on us, seriously! 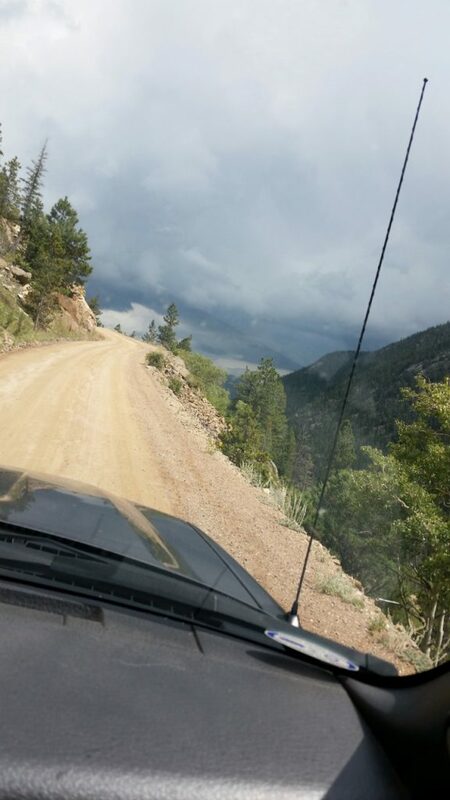 Notice the steep drop off and narrow gravel road….fair warning! Bonus tip – Read tip #1 again. That’s my 25 tips for a better trip! RMNP is one of the best parks to get out and enjoy. The hiking is amazing and there is so much to see and do! 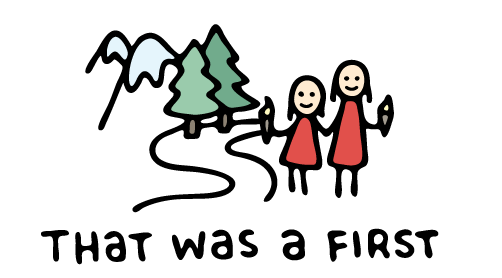 Your family will definitely experience a lot of firsts! What tips can you add to my list? The more the better, because everyone wants to have an awesome vacation! A few years ago a friend and I went to Glacier National Park. It was during the off season so no one was at the booths, so eventually we just drove in. We totally felt like we were doing something wrong! But we couldn’t get that far into the park anyway. (We knew we wouldn’t be able to.) We still loved what we saw, though! I was just at Rocky Mountain National Park a few weeks ago. It was a really rainy day so all we were able to was drive around and stop at a few places to take a look, but it was still gorgeous! Would love to go back one day. We love RMNP! I haven’t been to Glacier yet, but am planning to go within the next few years (before the glaciers are gone). I’ve never been hiking before, but this was so helpful! I haven’t been to any National Parks yet unfortunately! RMNP would be a great park for your first! These are excellent tips! I haven’t been to any National Parks yet but they’re ALL on my bucket list! Thank you! Our National Parks are beautiful! I’ve never been to RMNP but I’ve always wanted to go. These tips are really great! I’m going to save this post for when I plan my next trip to America.